Easy to use application to download and transfer Audiobooks from local libraries which use the RBdigital lending platform. I have been a happy user of Hoopla for a long time and unfortunately my library decided to migrate many of its holdings to RBdigital. I was saddedened—if it ain’t broke, why fix it? 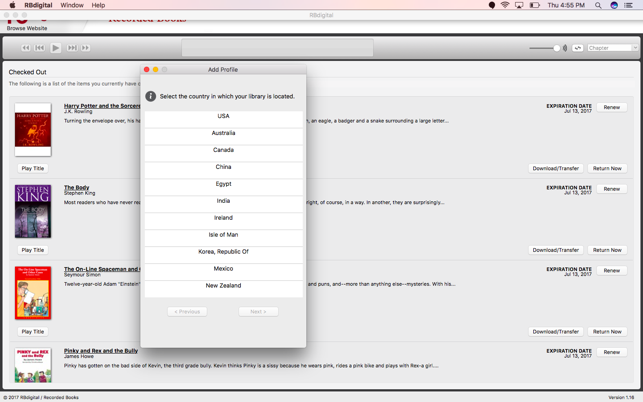 I liked browser based media playing—there’s no earthly reason this needs to be another dumb app. 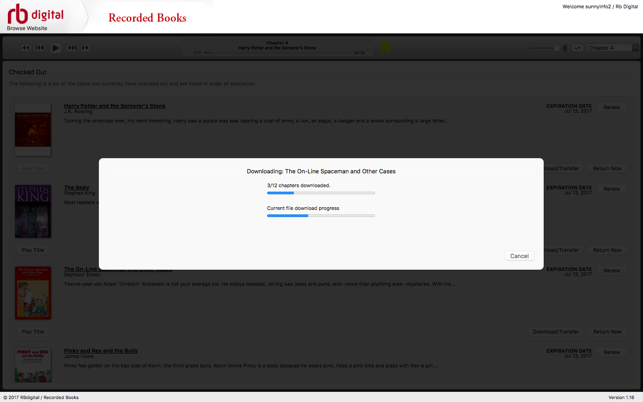 But I had no choice so I duly downloaded RBdigital and tried to load an audiobook. In the menu all the chapters seem present, but when I go to play them half of them are repeats. 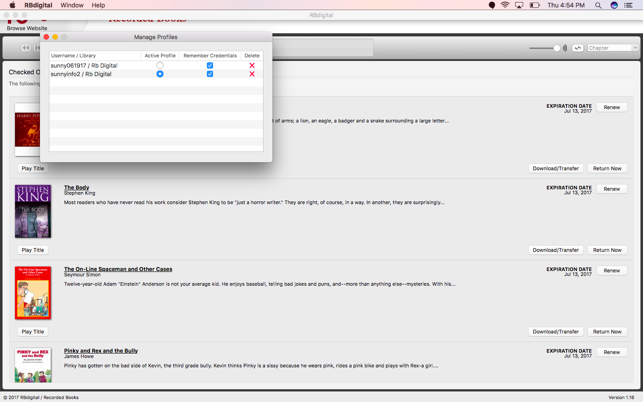 Chapters are all mixed up, the tab for “Chapter 23" plays the audio file for chapter 22. The tabs for “Chapter 24” and “Chapter 25” both play the audio for chapter 23. “Chapter 26” plays the audio for chapter 25. Nowhere in the files does chapter 24 seem to exist. 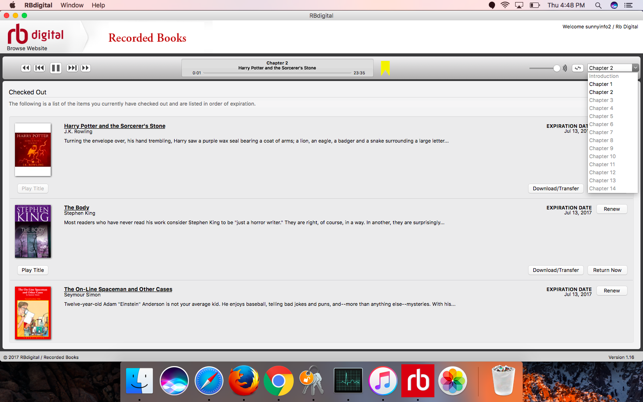 The idea of breaking an audiobook into chapters is reasonable added functionality. The issue is that it is terrible implemented and that this is an awful app. Do yourself a favor and avoid if you have a choice. RBdigital is bad and there’s no way around it. I depend on bookmarks. Other apps I’ve used for audiobooks always automatically placed a bookmark and took up again at that spot when I re-opened a book (because you don’t listen to the whole book at once). This app rarely goes back to where I’ve left off and occasionally has totally wiped out the bookmarks I set. I also have a great deal of trouble downloading books. I get an email from the library telling me the book is available (often after weeks or months of waiting), but when I go to Holds on the app, sometimes the book is marked “19th in line” and I can’t download it. A couple of times this sort of thing has happened and then, suddenly, the book is downloaded, but I have no idea how. Login fails. But there is a solution! If your library username/password fails, there is a solution: Use your RBdigital login. The app says to use your library login, but it failed for me. I called RBdigital and they told me that depending on the library, some people should user their RBdigital login while others should use their library login. This inconsistency is what is causing the problem. 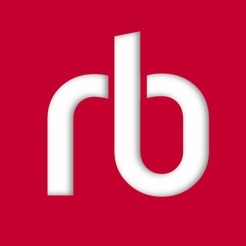 The app says to use your library username/pin, so how would users have any idea that they should be using their RBdigital login? This inconsistency with logins should be addressed because it is causing major confusion. At a minimum, the app should be updated to notify users that if their library login fails that they should try using their RBdigital login. This would save a lot of people time and effort trying to figure out why their login fails, as I’m sure many people just give up on the app and leave a 1-star review. I have given the app a 1-star review simply because this login issue is so glaring and such a usability fail. However, if this one issue were resolved I would rate the app on its actual functionality past logging in.